Since you are not sure of the answer to the above question, please consider taking our ONLINE BEEKEEPING COURSES. Click Here Now For More Info. When getting started in beekeeping a common question is, "How many hives should I start with?" Many people wonder if they can handle more than one hive. They rationalize that if beekeeping doesn't work out, then it is easier to get out of it with only one hive. Let me tell you what my opinion is on how many hives to begin beekeeping. Keep in mind that colonies of honey bees can and do sometimes die out even after we do everything right. I call it a natural death. For example, one year in one bee yards I had about 30 hives. From that spring until mid summer, I lost one hive. Then from mid summer until fall I lost another one. Why? It was not CCD! The bees did not leave the hive all at once. They didn't abandon their young. They didn't have any pests or disease. They had honey. They just didn't do good. Mainly the queen is to blame. She wasn't a good layer in the beginning and I probably should have replaced her when I first noticed her weakness. After waiting too long, no matter how often I replaced her, it never worked out in these two hives. Usually it does. But a worker started laying and I didn't have time to try to rid her of the hive. I tell you this because if you have only one hive, and it goes wrong, then you don't have any hives left! With a few hives, two or more, you're always able to compare hives and keep going even though you might lose one along the way. I'm not ashamed to admit it that I've lost a few hives due to my own neglect or mismanagement. I'm just thankful I had a bunch of other hives to do it right with after I learned from my mistakes. This is why it is better to start with multiple hives than just one. When people ask me how many should they start with I usually tell them as many as they can afford. Many people who start with one or two usually call back and order more the next year. For those who truly enjoy beekeeping, they are always seeking ways to add more hives to their apiary. I realize that available space and time has to be considered. However, there is always a way to gain more places to place bees without having to buy land. Many farmers and land owners will gladly let you place your bees on their property for nothing more than a few jars of honey in return. The average backyard hobbyist should always start with 2 or more. Why? With two hives, you can compare the hives to each other. Usually if both hives are acting the same way, it is a normal bee "thing". If one colony loses its queen, then you can place a frame of brood with 1-3 day old eggs from the other hive into your queenless hive and they will raise their own. And if one colony becomes weak, you can equalize the two hives by adding more bees to the weaker hive. With one hive these management practices are not possible. 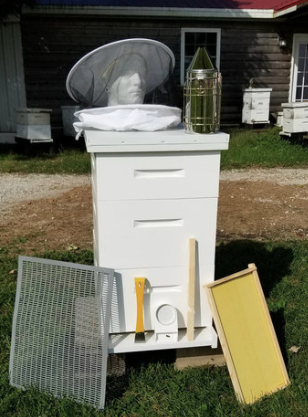 Click here to see our 2 hive kit. How much time you dedicate to beekeeping is entirely up to you. The extremes are, you can do nothing more than install your package in the Spring and do nothing at all, to the other extreme of inspecting your hives every two weeks. A good management practice is to inspect you hives every two weeks. This should only take about 15 minutes per hive. So for two hives, that's only a hour a month. But, here's how it really works for a lot of folks just getting started in beekeeping. They love it so much, they are always in the hive, looking at it, pulling frames out and showing friends and relatives. I opened one hive 5 times in one day show interested people the inside of a hive. It does disrupt their activities, so it is best to limit your inspections to twice a month, but some new beekeepers can't stay out of the hive, because it is so much fun. And the disruption is worth the experience you get by opening up the hive. With the more hives you have, the more you can inspect different hives and enjoy your hobby more. I once had a real nice motorcycle the kind you have to polish after every ride. I spent less time keeping 100 hives than keeping that motorcycle waxed! It really is manageable. With several hives, will the bees from one hive be confused and not know which is their hive? Will the hives fight each other? I've heard people argue that too many hives in one area can cause a depletion in nectar in that area so that only the strong hives do well. That might be possible if you live in the middle of a desert with only a handful of flowers within 12 miles. Most of us live in areas where there is plenty of nectar sources. Bees are sharp when it comes to finding nectar. You know where some good restaurants are and if you don't you know how to go out looking for that perfect steak house. Bees are even better than we are at finding food. It is extremely important to remember that bees fly 2-3 miles out to gather nectar. I think some people think of bees as dogs, meaning that they think the bees will stay in their yard. Unless you have a huge yard, it is not' going to happen. Within a 2 mile radius there are over 8,000 acres. A 3 mile radius includes over 12,000 acres of nectar to choose from! Wow! It just makes better practice to start with two or more hives. I started with one hive and through neglect it died off and since I had only one hive, I was out of beekeeping for several years. Now don't let me discourage you if you can only start with one hive. You can start with one and do great! You can add more and more hives as the years go by. And, your one hive may never die. Instead, you might get many splits from your first hive. You just never know. But, your chances of success are increased by the more hives you have.